As many of you will know, my PhD research is exploring the concept of PLNs and networked and connected learning, by investigating how teachers experience professional learning through their own PLNs. This post is based upon my research, and was created in part because I was asked by the lovely Dr Mandy Lupton to prepare a mini-lecture on PLNs to introduce the concept as part of the QUT Master of Education subject Connected Learning. This post includes two short (10 mins) videos where I explain the theory underpinning PLNs, and present a deconstruction of what we mean when we use the term ‘PLN’. I have also included much of what I say in the video within this blog post, so that if you prefer, you may read and process at your own pace. This transcript has loads of links also, so you can read further and find the research that I refer to. I hope that this post is useful. I feel that it fills a gap in what is currently available on PLNs – we have loads of practical information about how to use different digital tools to learn online, and also many blog posts encouraging us to dive in and explore learning in this way, but little which draws together the research on how PLNs actually work, and why they may lead to powerful experiences of learning. PLNs are nothing new; teachers have been networking for years to learn, share, discuss and feedback on ideas and strategies for the classroom. But we didn’t call our network a PLN – it was just the people we knew and worked with. More recently, online networks have broadened the definition. With access to the internet, and more importantly, the interaction that social software provides, the PLN may be expanded to include a wide range of people from all over the world, each with their own knowledge and experience to share. This diversity is what enriches the learning experience and enables opportunities for knowledge creation to occur. Learners become amplifiers as they engage in reflective and knowledge-building activities, connect and reconnect what they learn, add value to existing knowledge and ideas, and then re-issue them back into the network to be captured by others (p.16, 2009). So now we have a basic grasp of what a PLN might be. The next step is to explore the theory that underpins PLNs. This information is from my research. At the end of this post, I also will add some practical ways of thinking about PLNs in light of the connected learning framework. A good way to begin is by breaking down the term Personal Learning Network. The P in PLN may stand for many things. Often it stands for professional, to describe the type of learning that is taking place through the network. I use the term Personal, because I feel that this describes how learning through a PLN is an autonomous experience. Every PLN is created by an autonomous individual, who drives their own learning according their interests, passions and learning needs. This is the paradox of the PLN. It is based upon social learning, but the learning is driven by the individual. As Stephen Downes says in his description of networked learning, the learner operates independently, but not without input from others. It is this independence which allows the diverse responses which create a rich learning environment. Here I would direct you to my post which compares developing your own PLN to being the conductor of an orchestra. The conductor has a goal that is singular – to draw the best from each player, and to bring their playing together in such a way as to create magnificent music. The musicians in the orchestra represent the ‘nodes’ or contacts of the PLN – the people, information or resources that the conductor creates connections with in order to achieve this goal. The participants of a PLN may share certain goals – to enhance professional knowledge, to contribute to the greater good of the profession, to seek and offer support and collegiality. However, just as every orchestra has a conductor, every PLN is determined by the autonomous individual, who drives their own learning according their interests, passions and learning needs. Whether a PLN offers a successful learning experience is dependent upon the individual’s actions, although they require the contributions of many others in order to learn. The type of learning that occurs through a PLN is social learning. This type of learning acknowledges that we have created far too much knowledge for any one person to hold in their head at any one time. Our own cognitive capacity is limited in comparison to the amount of content that is available to us. With information and knowledge multiplying at an astonishing rate, theories such as networked learning and connectivism have evolved to explain how connections between people and information sources might create opportunities for knowledge construction. Connected learning offers us a pedagogical framework which has been designed around network learning and connectivism and the PLN draws upon these understandings of learning and knowledge. 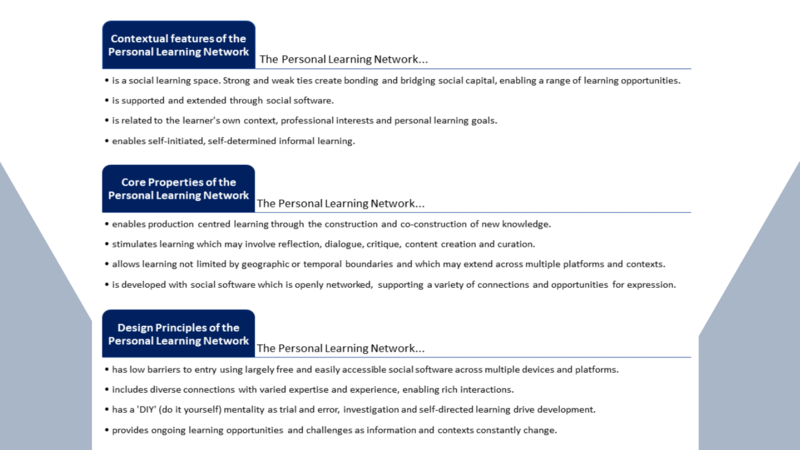 This table provides a summary of the shared features of networked learning, connectivism, and connected learning that underpin learning through a PLN. When we engage with learning through a PLN we are acknowledging that knowledge is distributed and socially constructed. What this means is that knowledge can be held by different people and (according to connectivist theory)* within non-human appliances such as computers. It is more important that we know how to find this knowledge when we need it then it is for us to carry this knowledge around with us in our brains the whole time. The capacity to create connections and to effectively search and filter large amounts of information is a much more important skill then simple memorization. *In the video, when explaining this table, you may notice that I said constructivist theory instead of connectivist theory. This is a slip of the tongue. Although these terms sound alike (and are easily swapped in error!! ), they are quite different. Constructivism is a theory that many of you will be familiar with, and indeed social constructivism, as defined by Vygotsky, does play a role in understanding these newer social learning theories. For a more indepth explanation of these different theories, please check out my previous post, Learning through connections in theory. Learning through a PLN is an active process of creating connections and seeing patterns of information within and between these connections. The learner decides what they want to know and navigates their network in order to seek the connections and sources which will provide the information they can use to construct this knowledge. In a personal learning network the learner is autonomous, as already mentioned, and is driven by their own goals rather than a shared set of goals developed by a group of people. Social software is what enables the connections and the spaces for learning. Learning through connections is not dependent upon technology, but it is through the affordances of digital tools, and particularly social software, that we can extend our PLN so that we can access learning opportunities which break through the barriers of time and space. Finally we come to the N which stands for network. We use the word network all of the time in our everyday speech however it is important that we understand what a network actually is and how connections form and are maintained, so that we can develop a truly effective PLN. A lot of the time learning communities and learning networks are treated as the same thing and yet they are quite different. Whether it is online or offline there are certain aspects that differentiate communities and networks. These features blur across these social structures, so the information below is not a set of hard and fast rules, but general features that have been identified of each. Generally, a Learning Community is formed intentionally by a group of people who know each other. This means they have strong ties, which is another way of saying that they interact regularly and that there is a level of trust between them. Because most members of a community will know each other, when one shares something with the group, it is more likely that this will be reciprocated and others will acknowledge this. The membership of the learning community is known – even if members don’t know each other well there is generally I sense that everyone is working together towards a shared goal such as the completion of a course or task. There are several advantages of learning within a Learning Community. The most obvious is the sense of security, as members tend to know each other and have a shared language and shared goals, so they are more likely to be supportive of each other. Also knowing each other means that members tend to be mutually accountable to each other. The disadvantages of learning within a community is that it is possible to have an inward focus – having a shared language and goals may become a reason for not accepting outside views. This may lead to an echo chamber or homophily. Learning networks can include members of a community, but networks tend to be more organic, undefined and have both strong and weak ties. This means that there will be some members of the network who are known to each other and others who may be unknown. The membership of a network is far more flexible and usually changing all of the time. The goals are personal to each individual, and while members might work together, they may be working towards different goals. The advantage of this is that the network is there to meet your own personal needs and by including diverse connections there is a greater chance of innovation and serendipitous discovery. Unfortunately, a network can include overwhelming amounts of information which can make it difficult to find a high quality learning the noisy channels. Also learning through a network can be quite ambiguous, as it is up to the individual to direct and set their own goals and to achieve those goals. I’ve blogged about the differences between different online social configurations previously, and you may find this infographic to be handy as it summarises this information in one document. Here’s a PDF version if you want to print it out. The personal learning network is the social learning space that is supported and extended through social software, where people can connect with others, interact and access a wide range of information. They can develop strong connections which offer them support and validation, and they also can connect with people from diverse backgrounds who they may not know as well, but who might contribute new exciting and innovative perspectives. A PLN is formulated around the learners’ own context, professional interests and personal learning goals. A personal learning network has properties which reflect those of the Connected Learning Framework. Participants are actively involved in constructing and co-constructing new knowledge through dialogue, critique, content curation, creation and reflection. A PLN can be situated across multiple platforms and contexts, allowing the learner to connect with individuals and information all over the world at any time of the day or night. Usually a PLN is situated on social software which is openly networked, which means that there are low barriers for entry and many different ways to express oneself and ones learning. PLN connections have varied expertise and experience which allows learners to mentor and be mentored. There is a ‘DIY’ (do it yourself) mentality, in that there are no formal teachers in place, and participants learn by doing, using trial and error, asking and searching for information to as they go along. Information and connections are constantly changing and so learning opportunities are ongoing and challenge is constant. Let’s have a look at my own PLN map. 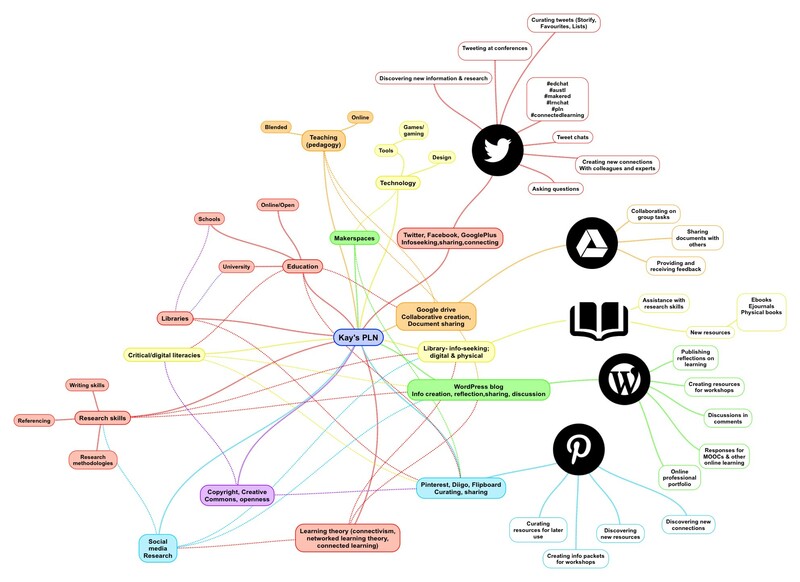 I’ve tried to connect the different tools that I use with the different areas of learning that I explore through my PLN. There are many different processes and strategies that I undertake as part of my learning. I search for information, I share information that I find, and also content that I have created. I connect and talk with individuals, some of whom I know well and others who are strangers to me. I work collaboratively on documents when I am invited, and I openly reflect and discuss my thinking through my blog. I create curated collections of content either for my own use or to use as information packets when I’m teaching. And I use the curation of others to discover new resources and new connections. I connect with different groups of people for different learning experiences, although there is a lot of overlap, with many people being interested in similar concepts and topics that I am. For these reasons, I would consider my PLN to be a connected learning environment. This has been a huge post, with loads of information! Drop me a line in the comments if you find it useful, or if there are things that you feel need further clarification. The best thing about a PLN is that you can learn anytime, anywhere, from anyone – and I have had so many wonderful experiences and opportunities as a result of the wonderful connections within my network – I hope that your experience is the same! Thank you very much for these vlogs. I am just new to the idea of the PLN and have found what you said to be true…it is easy to get sidetracked. I have a clearer view now. Looking at your PLN map certainly helped. So glad the map made things clearer! Thank you Kay for such an informative blog, I have referred to it many times during my course, and it has given me a better understanding in developing my PLN. …… I am in my initial stage, but I sure know where to look for whenever I need help. I’m so pleased that the blog has been a source of information for you, Ashrafi! It is so lovely to hear that my work is helping others. The blog does double duty – it helps me clarify my thoughts and also acts as a way to communicate what I am learning with others; such a powerful learning tool!